CSR investments may someday drive investments at CalPERS. That possibility is many years off but may a get start at the California State Retirees (CSR) Delegate Assembly, held October 22-23 in Sacramento. CSR is smaller than many of the unions representing currently employed public employees in California but our members vote. For years, CSR investments have been limited to government guaranteed securities. Although that kept risk of loss to a minimum, CSR investments made a minimal contribution to expenses. More than half of CalPERS payouts to retiree beneficiaries are paid out of investment earnings. CSR investments could eventually do the same for CSR members if invested wisely. We will not only leave a financial legacy to future California State Retirees, we will also educate our own members about investing and the issues faced by CalPERS. CSR investments total about $2.6M compared to $327B at CalPERS. However, $2.6M is enough to get our small group thinking about environmental, social and governance (ESG) issues at the companies where we invest. Within a few years, we could well be filing shareholder proposals, learning from and seeking support from CalPERS. The proposal below is specific to CSR investments but I mention and reproduce it here because readers may also belong to similar organizations that could further align their investment impacts with their values. WHEREAS, (1) Limiting investments primarily to government insured bonds makes sense for a new organization to ensure survival. Government guaranteed bonds are less risky. It also makes sense for retirees who are dependent on their savings to overweight investment into bonds because they risk going broke if their only income stream is Social Security. (2) If an organization (or retired individual) has relatively stable income that covers their expenses, it makes sense to invest a larger portion of the surplus in investment vehicles that have a higher return over time. CalPERS keeps payments for employees and employers low through investments, mostly in corporate equities. The CalPERS Pension Buck shows investments pay the largest portion of our retirement. (3) Like CalPERS, CSR is focused on the long-term. We should plan to eventually pay most of CSR’s routine expenses through earnings on investments. (4) Below is a chart comparing long-term returns from three strategies. 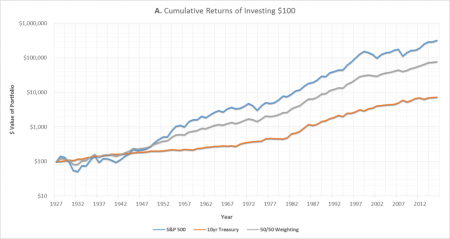 The cumulative returns of a $100 investment in US Treasuries between 1927 and the end of 2012 was less than $10,000. 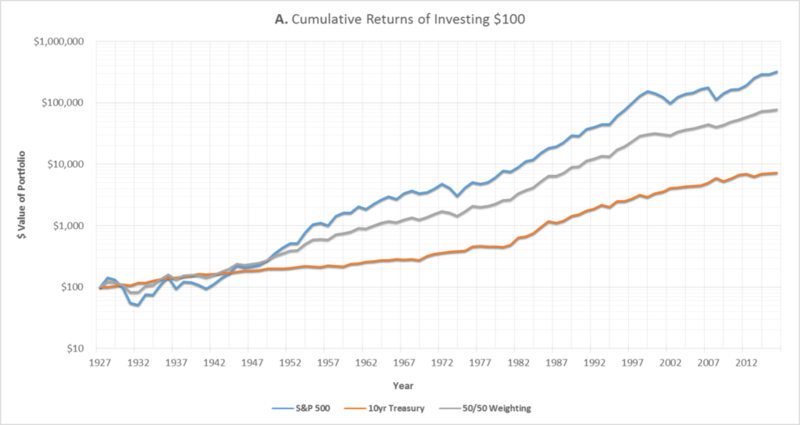 The same $100 invested in the S&P 500 returned about $500,000. A $100 investment weighted 50/50 returned about $90,000. (5) Current bylaws limit investments of “corporate funds in excess of those needed for current expenses” to government insured instruments. “Additional investments” can be made in investment grade bonds, diversified mutual funds, and exchange-traded funds. However, the language is unclear with regard to the source of such “additional investments,” since funds in excess of those needed for current expenses are limited to government insured instruments. Are these “additional investments” to be made from funds actually needed for current expenses? Additionally, the language clearly prohibits stock investments, limiting risk but also returns. We should give the CSR Board flexibility. (6) CSR should seek to be more like CalPERS, investing to pay an increasing proportion of expenditures through returns on investments. We will never be in that position by limiting our investments to guaranteed bonds. Amending the bylaws, as suggested, would allow the Board to direct an increasing amount of surplus funds into investments with higher expected returns over the long-term. (7) Another benefit from such a change would be to develop member awareness and expertise in the issues facing CalPERS. For example, are we investing in companies that take jobs away from public sector workers, harm the environment or are irresponsible? How can we use our power as investors to ensure higher returns, while addressing environmental, social and governance issues? By educating ourselves on these issues we will be in a better position to evaluate, advise and influence the CalPERS Board. (2) investment grade bonds, diversified mutual funds, and exchange-traded funds, and listed stocks approved by the Board. No more than 10% of funds in excess of those needed for current expenses will be allocated by the Board to investments in listed stocks. An investment committee of three members consisting of the CFO and two members knowledgeable in investments shall be appointed by the CSR President to make recommendations to the Board. The resolution passed, so expect to see CSR investing in stocks and eventually filing shareholder proposals on behalf of its members, who are also CalPERS members.